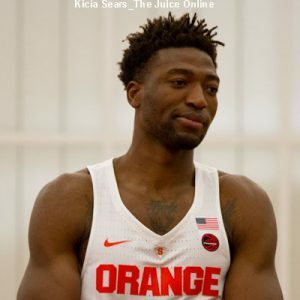 Syracuse put together their best performance of the young season on Monday night, putting away Oakland at the Carrier Dome in Hoophall Miami Invitational action, 74-50. SU (4-0) rebounded from a slow start out of the gate with a huge run capped by 12 straight points to take control of the contest, then used a pair of 8-0 runs to put the Golden Grizzlies (2-2) away in the second half. The Orange defense was simply suffocating, permitting Oakland to shoot barely north of 30 percent from the field as they blocked 15 shots. SU also forced 19 turnovers in the game, including grabbing a dozen steals. Meanwhile, Syracuse was efficient on offense, hitting 48.4 percent of their field goal attempts. Things did not start off well for the Orange, who fell behind by five points in the first 78 seconds and earned a timeout from Jim Boeheim. The head coach’s message clearly hit home, as SU returned to the floor and scored 16 of the game’s next 18 points, closing the run with a dozen straight markers. Frank Howard started the stretch with a pair of pull-up jumpers. After an Oakland bucket, Oshae Brissett banked in a jumper, then Paschal Chukwu converted an offensive rebound for the first Syracuse lead of the night. 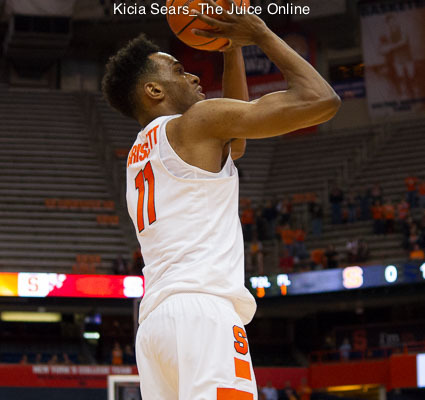 Brissett scored once more, then Tyus Battle dropped in two fouls shots and a floater. 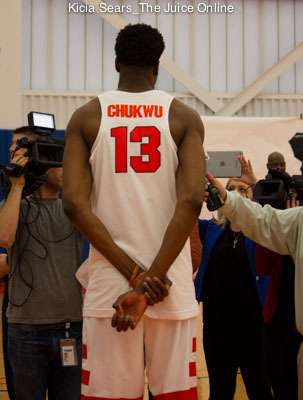 Chukwu finished the streak by converting a lob from Howard that pushed SU to an 18-9 lead with seven minutes gone. A couple minutes later, the Orange lead would reach double digits via six straight points. Brissett started the burst with a contested lay-in, then Battle added another floater and an 18-foot pull-up for a 26-16 lead. A little over four minutes later, Syracuse ran up seven more points to push the lead to 16. Brissett cleaned up his own miss to get things going, then Marek Dolezaj fed Howard in transition for a lay-up. Brissett and Dolezaj then worked a give-and-go for a two-handed dunk by the former and Battle would add on a foul shot for a 36-20 lead with just over two-and-a-half minutes left in the opening half. The Golden Grizzlies would inch back within a dozen, but Bourama Sidibe’s putback gave SU a 39-25 lead at the break. The game became a defensive struggle in the first ten minutes of the second half. Oakland used a series of three-pointers to gradually erode the gap and get within ten points. The Orange, however, roared back into control with a pair of 8-0 runs that bookended a 19-4 streak that delivered the knockout blow. Battle and Howard alternated markers for the first burst. Battle dropped in a short shot to start things off, then his backcourt mate swished a 12-footer from the right edge of the key. Battle drained both ends of a one-and-one to make it six straight points, then Howard swooped across the key for a lay-up from the right side for a 59-41 lead. After Oakland wrapped a pair of baskets around a Battle triple, SU tacked on the second stretch of eight straight points. Geno Thorpe found Howard on the right wing for a swished trey, then Brissett added the second foul shot on a trip to the stripe. Howard then ended literally the run and metaphorically the game with a long lead pass for a Thorpe lay-up and a driving lay-up of his own for a 70-45 Syracuse lead with just under five minutes on the clock. Tyus Battle finished as the top scorer in the game, rolling up 25 points, including 16 in the opening half. Frank Howard set a personal record with 18 points in the game. Paschal Chukwu was a force, finishing with eight blocks to complement his first career double-double of 12 points and 11 boards. Oshae Brissett fell one rebound shy of his own double-double, posting 11 points and nine rebounds. Martez Walker led the Golden Grizzlies with 14 points. Kendrick Nunn was the only other Oakland player in double figures, as he added a dozen points. James Beck chipped in with eight. The Orange will squeeze in one more game before Thanksgiving when they host Toledo on Wednesday evening in the Hoophall Miami Invitational. The Rockets (3-0) last played on Saturday when they defeated this same Oakland team at home, 87-74. Jaelan Sanford, the Rockets’ leading scorer on the season, averages 23.3 points per game and had 26 in the win over Oakland. Tre’Shaun Fletcher posts 20.0 points and 8.3 rebounds per game while Nate Navigato has hung 16.0 points per outing, hitting eight three-point shots in Toledo’s three games. SU and Toledo are scheduled for a 7:00pm Eastern start and the game can be watched online at ESPN3.com.